HomeNewsWhat about the Khmer Rouge Tribunal? More than 10 years have passed since the establishment of the Extraordinary Chambers in the Courts of Cambodia (ECCC) for the persecution of crimes committed during the Government of Democratic Kampuchea, commonly known as the Cambodia Tribunal or Khmer Rouge Tribunal. In June 2003 an agreement was reached between the Cambodian Government and the United Nations on the assistance and participation of the international community in the Extraordinary Chambers. 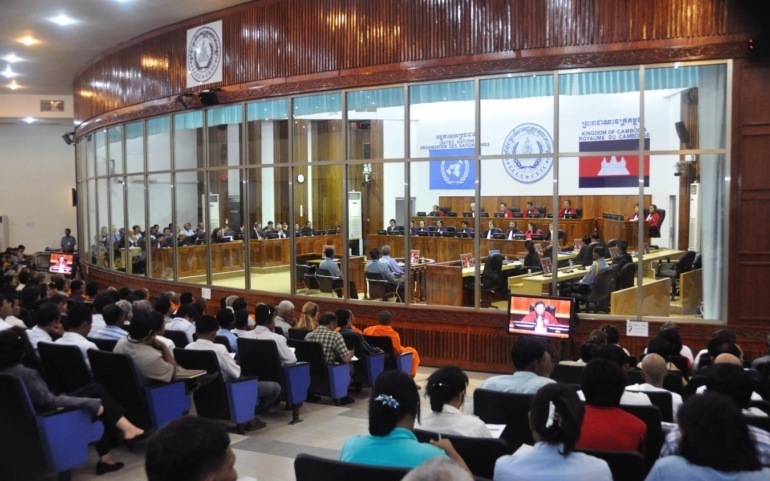 This new court, despite being created by the local government and the UN, enjoys strong independence: it is a Cambodian court with international participation that applies international standards. The Khmer Rouge regime took power April 17, 1975 led by Pol Pot, Nuon Chea, Ieng Sary, Son Sen and Khieu Samphan and was overthrown January 7, 1979 after 3 years, 8 months and 20 days, in which almost 2 million people were slaughtered, death by starvation, torture, summary executions and forced labour. In 1997 the government, led by Hun Sen, requested UN assistance for the establishment of a trial to prosecute the Khmer Rouge leaders. In 2001, the Cambodian National Assembly passed a law to create a court to prosecute the crimes committed during the regime. The government has insisted that, for the good of the Cambodian people, the trial had to be held in Cambodia using Cambodian staff and judges together with foreign personnel. However, the Court’s work is limited to the prosecution of only two categories of alleged perpetrators for crimes committed between 17 April 1975 and 6 January 1979: Senior leaders of Democratic Kampuchea and those believed to be most responsible for grave violations of national and international law. With this in mind were arrested and prosecuted the five considered among the most responsible for the massacre. The Court became operational from July 2007 when investigations and interrogations began on suspects belonging to the Khmer Rouge on genocide charges. In September 2007, the first arrest arrives for Nuon Chea, the former right-hand man of the leader Pol Pot, who in 1998 had received from the Cambodian government permission to live near the borders with Thailand. The Nuon Chea process started in 2011. On August 7, 2014 he received a life sentence for crimes against humanity. Right after Kang Kek Iew, also known as “Comrade Duch”, one of the Khmer Rouge leaders, who was responsible for internal security and managing prison camps, was condemned by the Court for crimes against humanity, genocide and violations of the Geneva Convention. The sentence was initially 35 years, but was reduced due to a period of illegal detention between 1999 and 2007 by the Cambodian Military Court. Among the five appear also the names of Ieng Sary arrested on November 12, 2007 and died in March 2013, and Ieng Thirith, wife of Ieng Sary and sister-in-law of Pol Pot, accused of being responsible for planning in instigating the Cambodians during the regime of the Khmer Rouge, but declared mentally unsuitable to be prosecuted because of Alzheimer’s, and died in August 2015. Khieu Samphan, director of the Democratic Kampuchea and Head of State from 1976 to 1979, received a life sentence for crimes against humanity in August 2014. Several have been controversies and criticisms raised from these processes. The first of these concerns the possibility of extending the Court’s range of action to other responsible who do not fall within the definition of “those considered to be the most responsible”, as in the case of Meas Muth, at the time navy commander, who remains on the loose despite the issuance of two arrest warrants on charges of committing war crimes and crimes against humanity, thanks to the strong opposition of Prime Minister Hun Sen, who has always opposed the enlargement of the trial to other figures of the former regime, having himself been a commander of the Khmer Rouge, thus violating the 2003 agreement between the United Nations and Cambodia on the creation of the Court. Precisely for this reason, for many the outcome of the process appears to be bankrupt, since it affects only a small part of those responsible for the extermination of nearly two million people. The second controversial issue concerns the work of the Court, in particular its funding. The Cambodian Government and the United Nations are both responsible for managing the costs of the Court’s operations, which is fully supported through voluntary donations from over 35 countries. Donations to the Court are kept separate from other donor funds involved in development assistance in Cambodia. Data show a total contribution of $224.3 million donated between 2006 (the year when the Court’s work began) and updated to October 31, 2017. Among the major contributors, in addition to Cambodia, there are Japan (69.801 million), the United States (30.813 million), Australia (26.758 million) and the European Union (11.752 million). Between 2006 and 2012 was spent on the court 173.3 million dollars in 2014 and has reached over 200 million and, in light of this expenses, only one case had been brought to a conclusion. To this day, there are other potential defendants who have been investigated by the Court, but, as with the Meas Muth case, the allegations will probably never be carried out because of the strong resistance of the government. The diplomatic responses of donors, as reported by the Phnom Penh Post, have diverted the explicit commentary on the immediate fate of the remaining cases, but have urged the court to “move forward”, “continue” and “succeed”. It is likely that the way in which success will be defined will be the key to close a process the Cambodian government no longer supports. Naoaki Kamoshida, Counsellor at the Embassy of Japan, said that his government “attaches importance to the Khmer Rouge Tribunal” because it brings justice to victims and strengthens the rule of law in Cambodia, and he adds that “in light of the aging of the accused and the victims more than 35 years after the collapse of Khmer Rouge, Japan encourages the tribunal to accelerate the judicial process”. In addition to greatly limit the scope of the Court, the Cambodian government also denied access to potential witnesses who currently hold important positions within government. Despite the limited number of convictions, the modest results and the difficulties, the Court has undoubtedly played an important symbolic role keeping alive the historical memory and creating awareness within the country and in the international community.